Several weeks ago I came across a large bolt of vintage fabric that I knew I had to have. 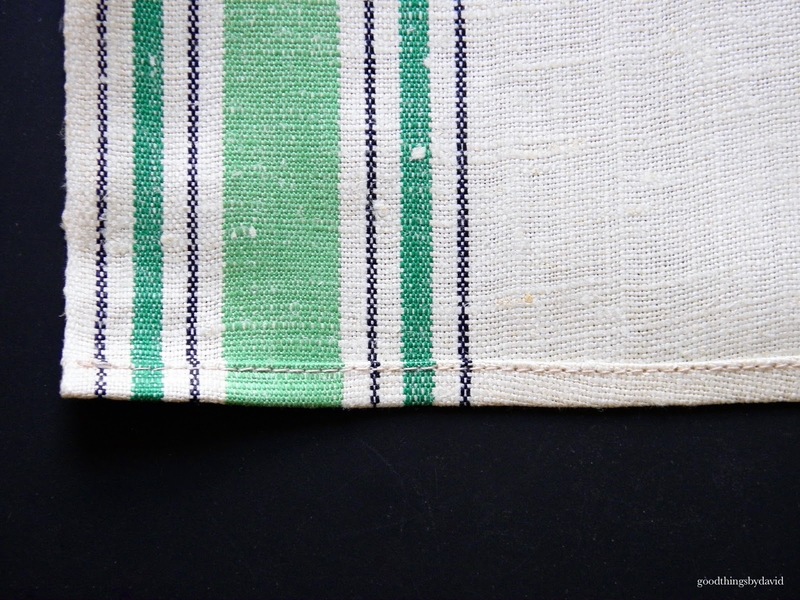 The linen was new-old stock from the 1950s with a lovely green-striped pattern along the edges. In my mind I was already turning this fabric into something for my kitchen, because the cream colored background and the green-striped edging of the linen looked like it would be an exceptional match with some of the green kitchenalia that I collect. I love how creative some people can get with their hand stitching, embroidery and various sewing creations. Unfortunately I don't fall into the category of being adept with a needle and thread, so I rely on knowing people who are. After approaching a local seamstress about what I had in mind, she quickly walked me through what she was going to do. 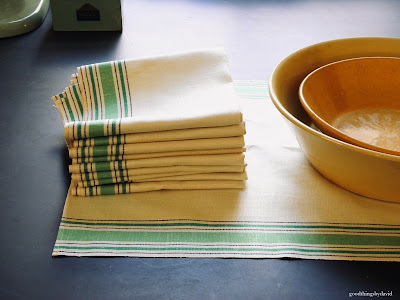 The 10 yards of fabric would be cut into 1 yard pieces, and each piece would then get a stitched hem to create the kitchen towels of my dreams. 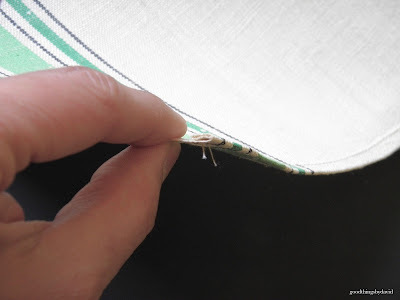 Since I specifically asked for a 1/4" seam (above), the seamstress told me that she would take 1/2" from each edge, and fold that extra 1/4" inward to give the towel a sturdy, crisp edge. You can see the extra 1/4" fold that was given to each edge. Once they were stitched with a cream colored thread, each towel was then pressed with a professional steam iron. Done! My "vintage" 1950s tea/kitchen towels are ready for duty. They are in such perfect condition that I won't hesitate to gently use them however I see fit throughout the kitchen. At almost 36" in length, the towels are large enough and undeniably sturdy to use as "lapkins" for an informal lunch. They look great with my yellowware, my enamelware, and, of course, my jadeite. Keep an eye out for large pieces of fabric from yesteryear at vintage shops, online and at yard sales. If you ever come across any that speak to you, buy the fabric and either make placemats, table runners, napkins or tea towels with them. Your new-old kitchen towels are going to look fantastic in the kitchen. 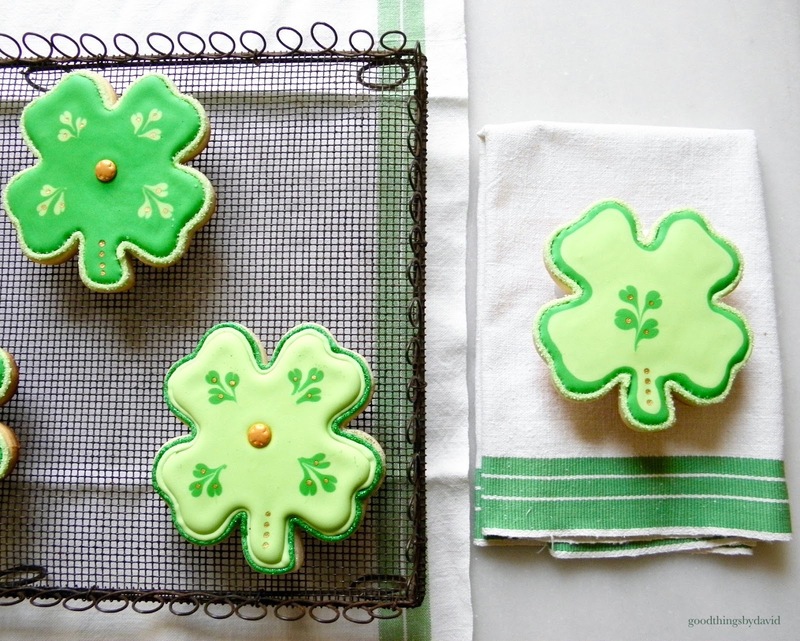 The easiest, quickest way to ice sugar cookies for St. Patrick's Day is to make them in shapes of four leaf clovers. 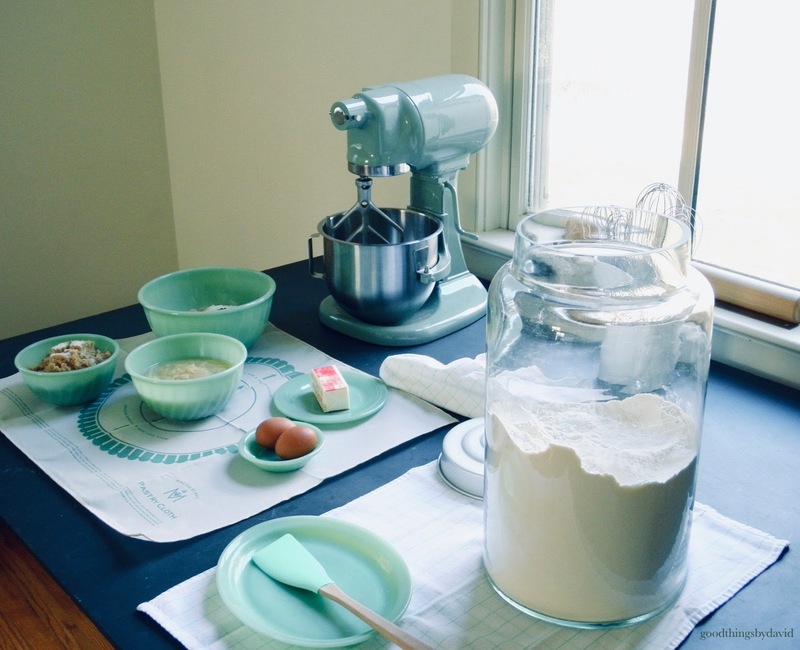 By keeping the designs simple, and by using only two shades of green, you're St. Paddy's day cookies can be made in no time at all. As much as I would like to dedicate several days to make very intricate designs on my cookies, I always end up keeping them pretty straightforward. Let's jump right into the designs I made for the people of my town. 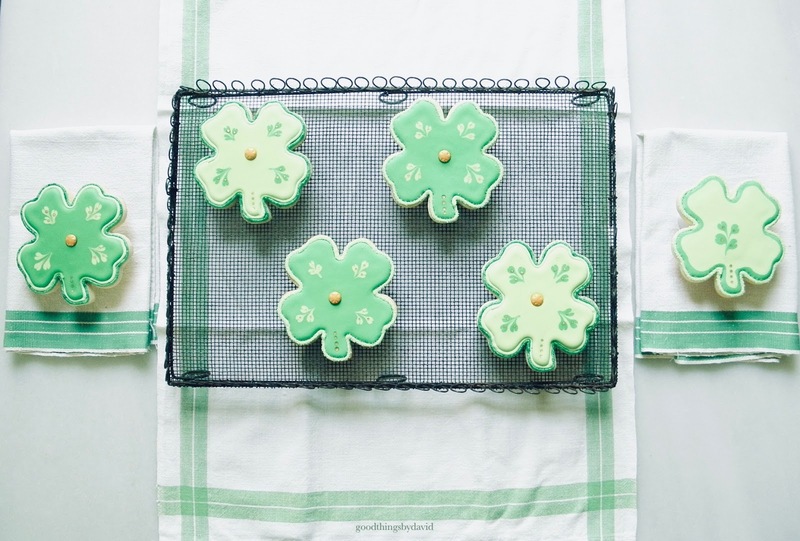 Start by cutting out some cookie dough with a large 4-5" four-leaf clover cutter (you can use smaller cutters if you feel like it) and baking them until they are done. 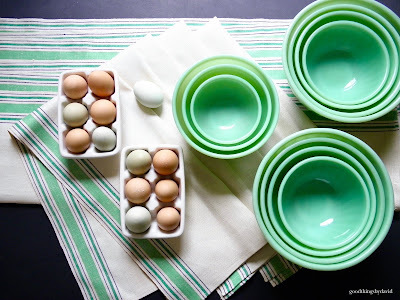 Make a double batch of my perfect royal icing and have gel food coloring in 'Kelly Green' and 'Leaf Green' at the ready. 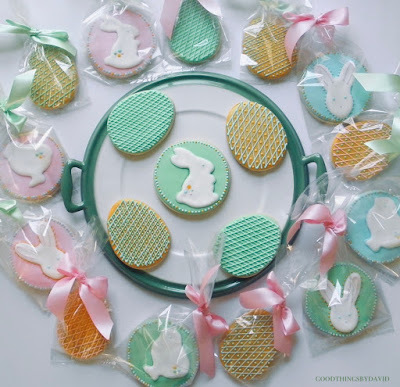 Once the cookies have cooled completely, tint the royal icing in two shades of green and get it to the right flowing consistency for piping. 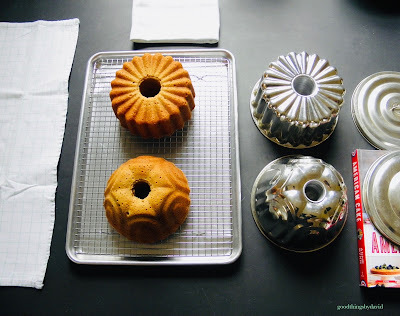 Whether you use squeeze bottles or pastry bags, fit each with either a #3 or a #4 plain piping tip. Begin by outlining the clover cookie with a bead of green icing (in either shade). Immediately flock it in either fine sanding sugar or in dark green edible glitter (add the glitter with a paint brush and do so delicately). Let the icing and sugar/glitter dry completely. Shake off the excess. Add another bead of royal icing in either the opposite color or in the corresponding color along the edge of the dried icing, and then immediately flood the entire cookie with the royal icing. 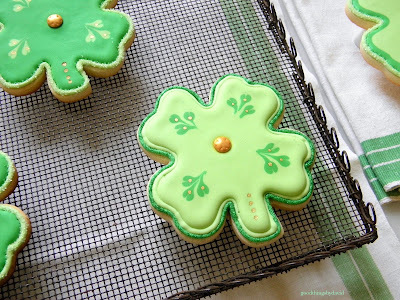 While the icing is wet, add 3 dots of the opposite color on each petal of the clover. Add the dots in the form of a triangle. Working quickly and while the icing is still wet, drag the icing with a decorating pick (or a toothpick) and create a shamrock design as shown. 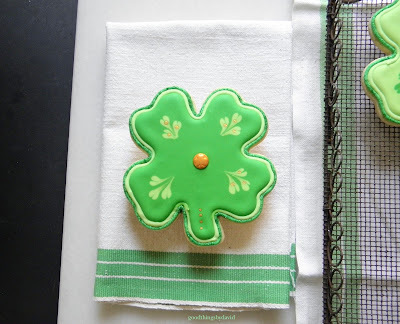 Add a gold shamrock candy in the center of the cookie. Let it dry completely. Using gold cake decorating highlighter thinned out with a flavorless alcohol, apply small dots of gold on each petal of the 3 leaf clovers and along the stems of the large 4 leaf clover as shown. Done! In my decorating frenzy I realized this cookie had a flaw in it. Do you see it? I completely forgot to add 3 gold dots on the bottom left clover design!!! Arrrrrgggg. I do have to say that I am all of a sudden addicted to adding edible glitter to my decorated cookies. I think it makes cookies look very unique, special and dazzling. There you have it folks. 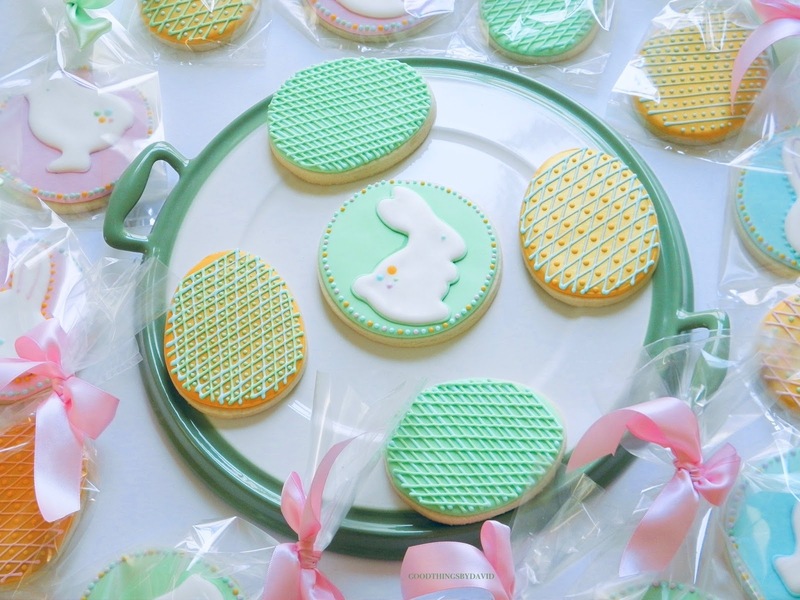 Easy peasy cookie decorating for St. Paddy's day. 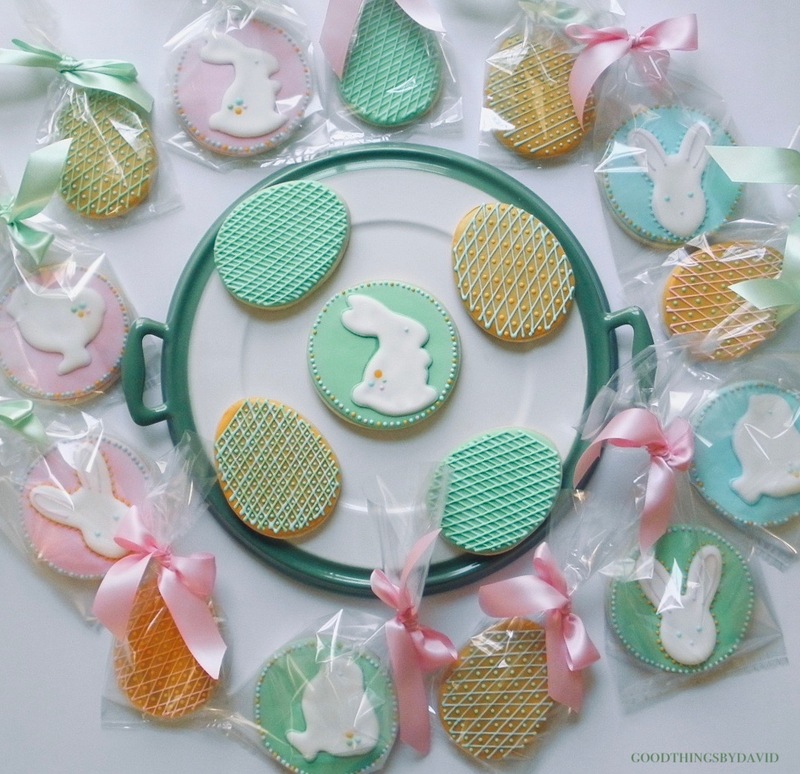 Get those cookie cutters out and start making some sugar cookies for your neighbors, friends and family. If you want to give some to your coworkers, make extra and slip some into clear cellophane bags. 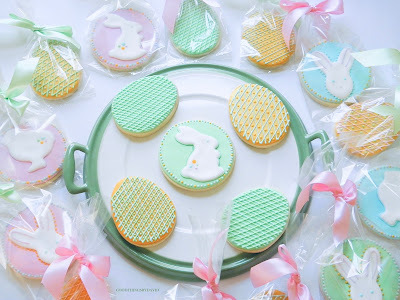 It's so difficult to resist an iced sugar cookie, especially when it is bright and colorful. 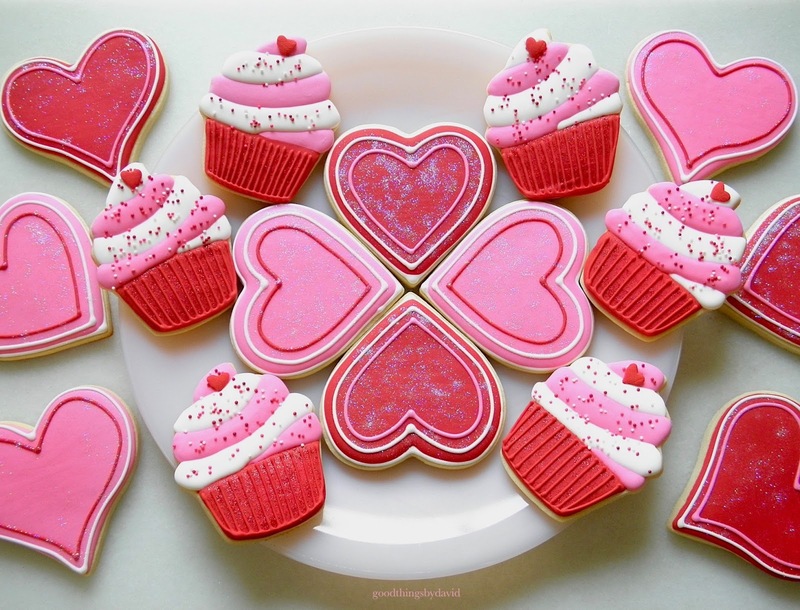 For Valentine's Day, heart and cupcake cookies iced in reds and pinks make for very festive treats to give to your loved ones. Who doesn't remember having to pass out Valentine's Day cards in elementary school, making sure that every single classmate had a card in his or her little "mailbox"? 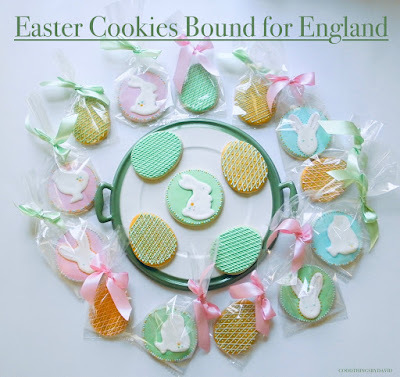 These days, handing out iced sugar cookies to those kids and teachers who are allowed to eat such treats, seems very appropriate for the holiday. 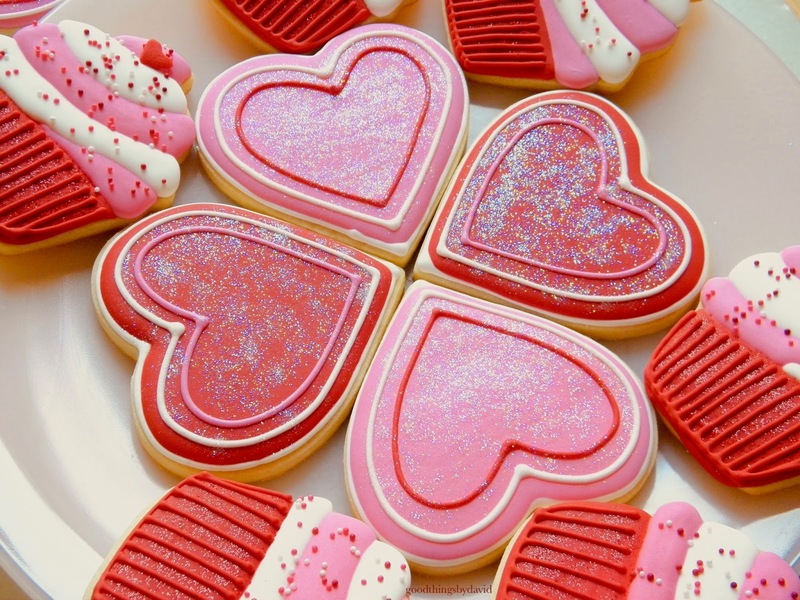 Variations of sugar cookies in the shapes of hearts and cupcakes abound online, which is why I think it's a great idea to ice them as you see fit. There really is no way to go wrong because the end result is always sweet. For my Valentine's Day cookies this year, I decided to give each one a little sparkle, a little pizzaz and lots of eye popping colors. All of the designs are easy and I may have even repeated myself from year's past. Oh well, it's bound to happen! 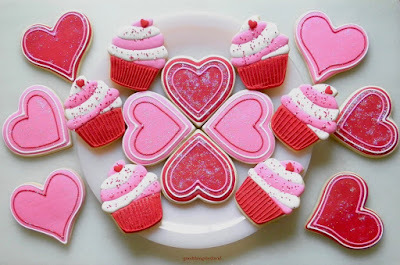 Valentine's Day Cupcakes: On a baked cupcake-shaped sugar cookie, outline and flood the cupcake liner area using a #4 piping tip in a bright red-red royal icing and immediately, yet carefully, flock the area with red edible glitter; let dry. Outline and flood alternating layers of "cupcake frosting" in either electric pink or white royal icing using a #3 piping tip, letting the alternating layers dry slightly (15 minutes is good), and then outline and flood the remaining layers of "cupcake frosting" in the other color. This will give you the desired "layered section look". 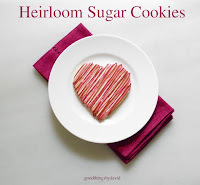 Immediately flock the frosting area with red, pink & white nonpareils, and affix a heart-shaped candy at the top. Let dry. Outline the folds of the cupcake liner as shown, using the same red-red royal icing and a #1 piping tip; let dry completely. Done! 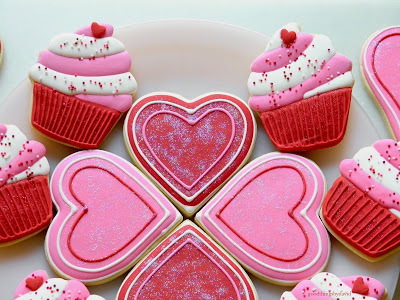 Valentine's Day Hearts: Outline the heart with a bead of white royal icing using a #3 piping tip and let dry slightly. Outline and and flood the entire base of the heart in either pink or red royal icing using a #4 piping tip and immediately, but carefully, flock the base of the heart with sparkly, edible glitter. Let dry. Pipe inner hearts in different colors with either a #1 or #2 piping tip. Let dry completely. What could be easier? Nothing fancy, nothing difficult. Everything is beginner's royal icing technique, easily achievable by anyone with a piping bag. 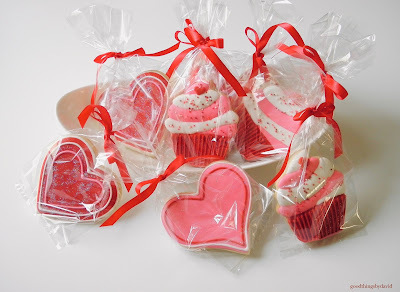 If you want to be nice, you can carefully package each cookie in a clear cellophane bag tied with a red ribbon, and hand them out as you see fit. If you're hosting a Valentine's Day dinner or a party, simply put all of your cookies on pink glass platters and cake stands. If you want to surprise the kids, put them in their lunch bags with a little note attached. For your honey, put one next to the coffeemaker the night before or place one in their car before they go to work. They're going to love you for it. It seems as if steamed puddings are rather underrated these days. Most of us have abandoned the tradition of steaming desserts over a burner for hours on end, opting for baking our delicious sweets instead. I admit that I don't steam puddings too often, but whenever I do, I know that the end results are always unbelievably good. 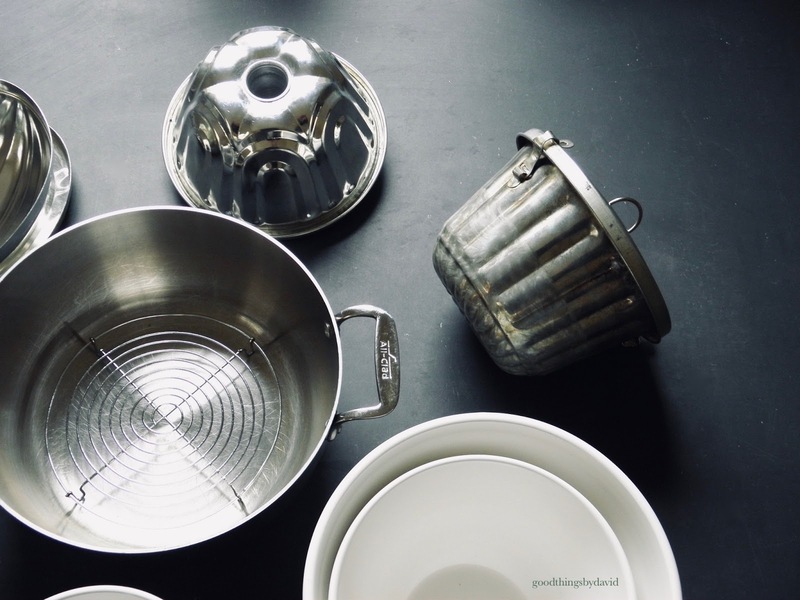 In essence, steamed puddings are nothing more than cakes which have been steamed in bowls, molds or cake pans. 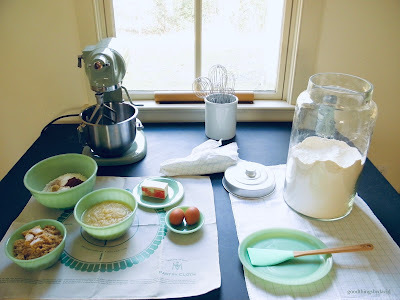 Just about any good butter cake recipe can be made this way if so wish. However, it's always best to choose those which have deep, spicy flavors. Pumpkin, persimmon, ginger, chocolate, apple and fig are just some examples of steamed puddings that have the perfect assertive flavors for steaming. 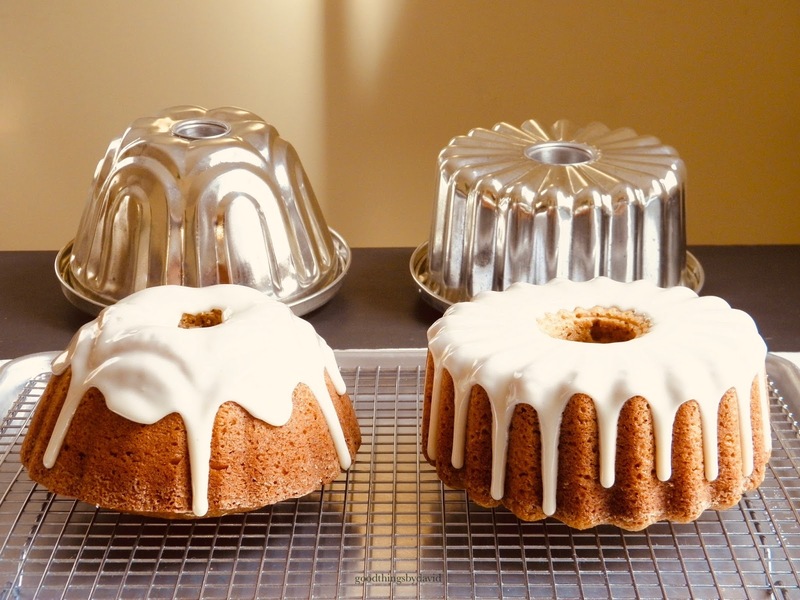 An apple spice cake recipe that I make every single year was turned into a set of steamed puddings over the weekend, and the results were well worth the effort. 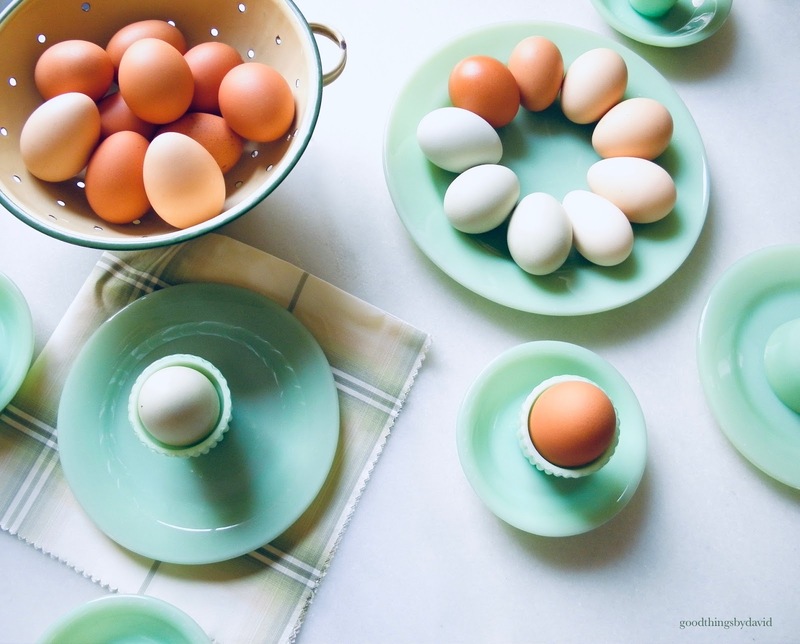 From the eggs, flour, butter, sugar, fruits and spices, make sure that your ingredients are ultra fresh. The more impeccable the contents, the better the end results. 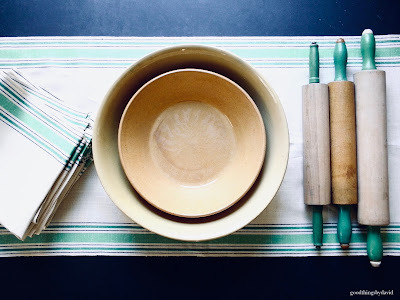 Whenever I get my ingredients ready for baking, I like to spread out at least one or two clean kitchen towels on my counters so that I can catch any ingredients that fly out of the mixer, bowls or canisters. It makes cleanup so much easier. 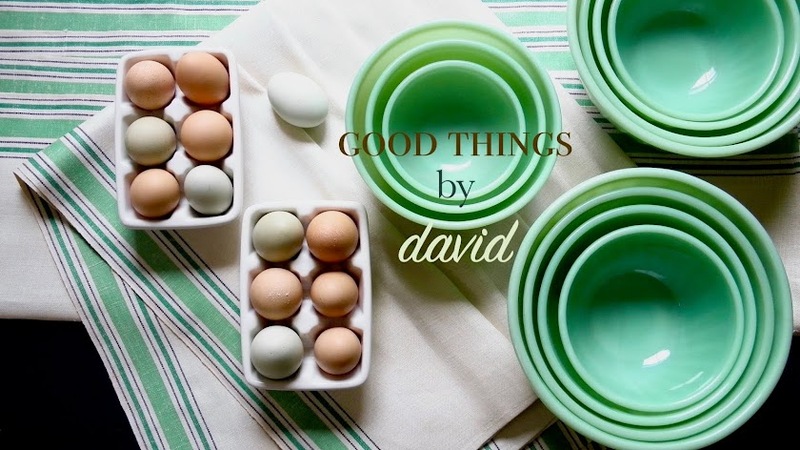 Steamed pudding bowls are easily found at kitchenware stores and online. 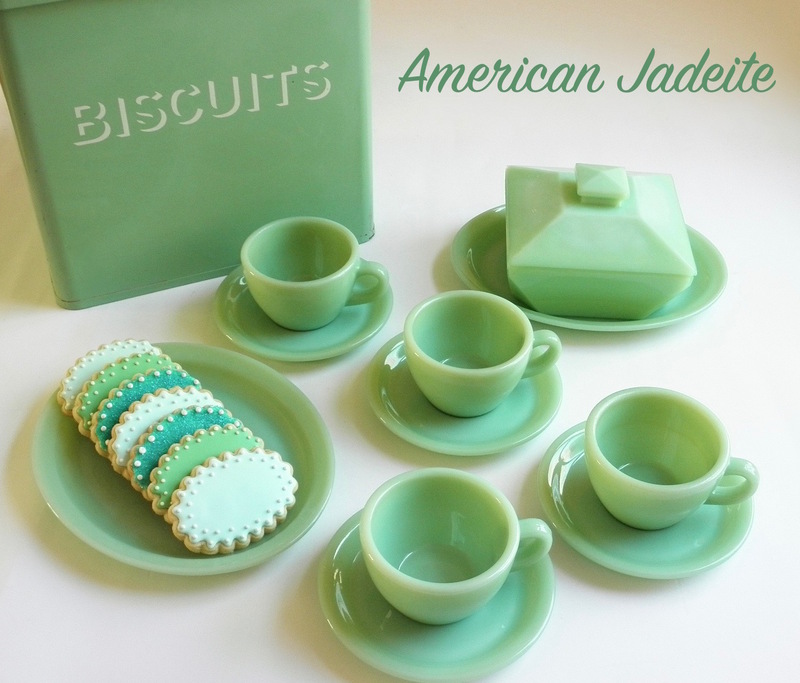 These are usually made of porcelain or ceramic, but they can also be made of ironstone or glass. They come in several sizes, with 1qt. and 2 qt. being the most common. 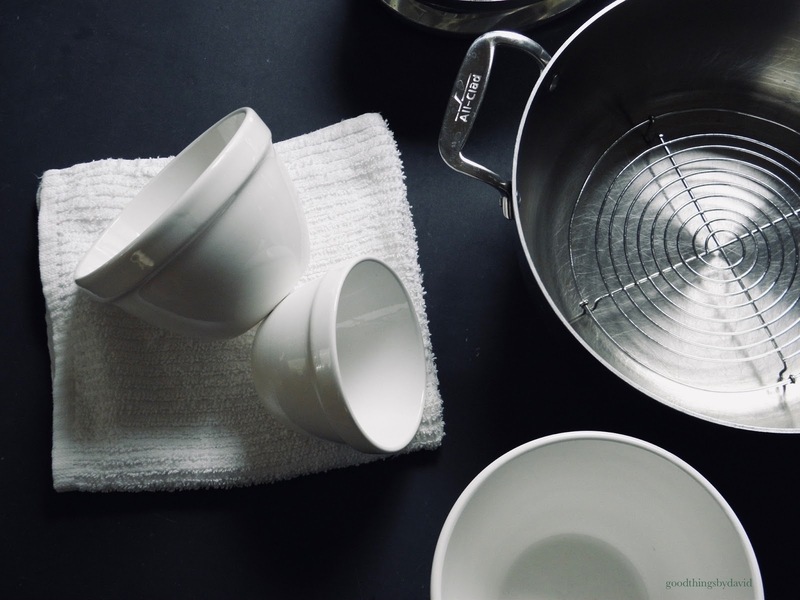 If you plan on using one of these bowls to steam your pudding, keep in mind that you will have to create a lid for it while the dessert is steaming. The best thing to do in this situation is to cover the bowl with a piece of parchment paper, once it's filled with the batter, and then tie it with a piece of butcher's twine. This can then be covered with a heavy plate or a piece of foil wrap so that condensation doesn't make its way into the pudding. The tilted steamed pudding mold has been used countless times. You can see how the simmering water has marked this tin over the years. Steam pudding molds made from tin come in a variety of sizes and shapes. Some have inner tubes much like bundt pans, but some do not. These come with lids that are either held down with clasps or with with small indentations on the rims of the tins. 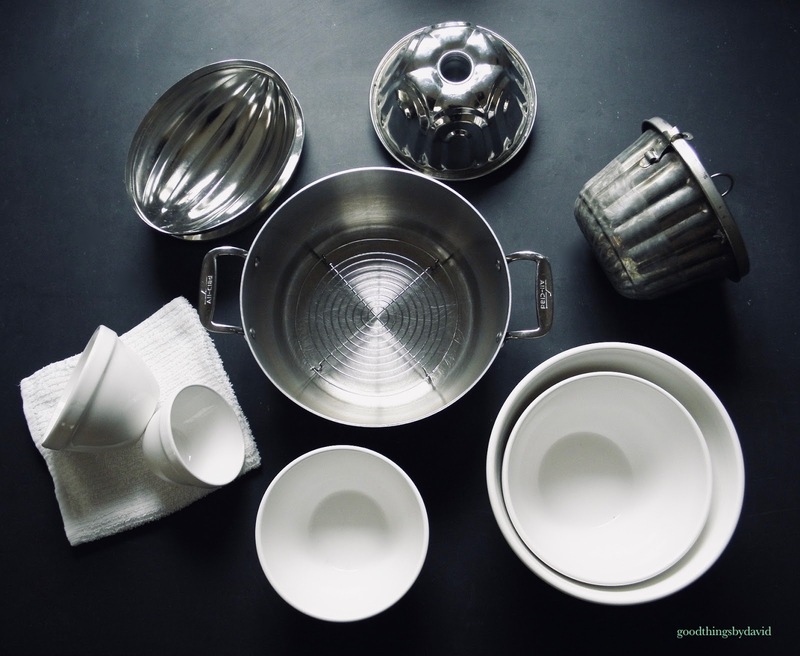 Whether you use a pudding bowl or a pudding tin, find a stockpot that is deep enough to hold the vessel with the pot lid closed. Find a small round rack (as shown above) to keep the bowl or tin from touching the bottom of the pot as it is steaming. While you're making the batter, set a teakettle full of water to come to a boil. After you've made the batter and have poured it into your prepared tin or bowl (make sure you've securely closed the vessel), center the pudding onto the rack in the stockpot. Pour enough boiling water to come halfway up the sides of the pudding tin or bowl. Set your flame to keep the water at a gentle boil and steam according to your recipe. In general, steamed puddings made with butter will take anywhere from 1-1/2 hours to 2-1/2 hours to fully cook through. Back when steamed puddings were made with suet, this took anywhere from 3-4 hours. All baking times will vary according to the recipe and the size of your pudding(s). 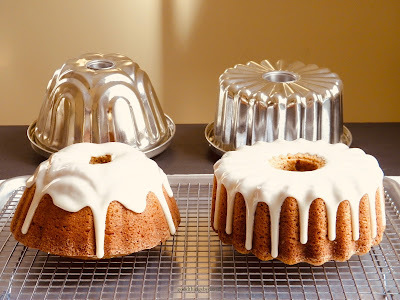 When the puddings are done, make sure that they have rested in their tins or bowls on a cooling rack for at least 15 minutes before unmolding. Glazed or not, steamed puddings are indescribably tender and very flavorful. I liken them to bread puddings that resemble small cakes. They're a good alternative to fruitcakes if you don't happen to like them during the holidays, but they're also great to serve at small dinner parties or gatherings in wintertime. Depending on the recipe and the mold that you've used, a steamed pudding will serve 6-8 people. Have you steamed a pudding lately?